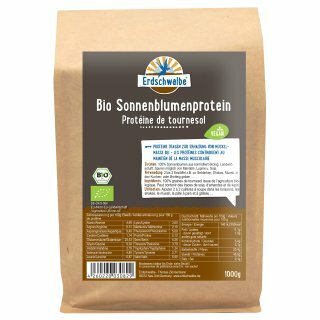 Erdschwalbe Organic Sunflower-Seed Protein Powder 1kg bag - Protein contributes to a growth in muscle mass. Ingredients: 100% sunflower seeds from certified organic agriculture. Use: 1 to 2 tablespoons for drinks, shakes, muesli or similar, or add to cake or bread batter as flour substitute.